Old North State Politics: Democrats Target NC General Assembly Seats--But How Big A "Wave" Might Be Needed in November? Democrats Target NC General Assembly Seats--But How Big A "Wave" Might Be Needed in November? This week, the North Carolina Democratic Party released a "target list" of General Assembly districts for the fall general election. And while much has been made about an impending "blue wave" that can benefit Democrats and put Republicans on defense, the measurements for estimating the size of the wave is, at best, any pundit's guess at this point in the mid-term cycle. One aspect that could give some clues as to the potential size of a "blue wave" is a baseline relationship between President Trump's performance in a legislative district and how it corresponds to the performance of the Republican candidate in the same legislative district. If the mid-terms are a referendum on the president's popularity (or lack thereof), using presidential performance as the baseline for a legislative district could give a sense of what Democrats would need to overcome the Republican-leanings of a district. 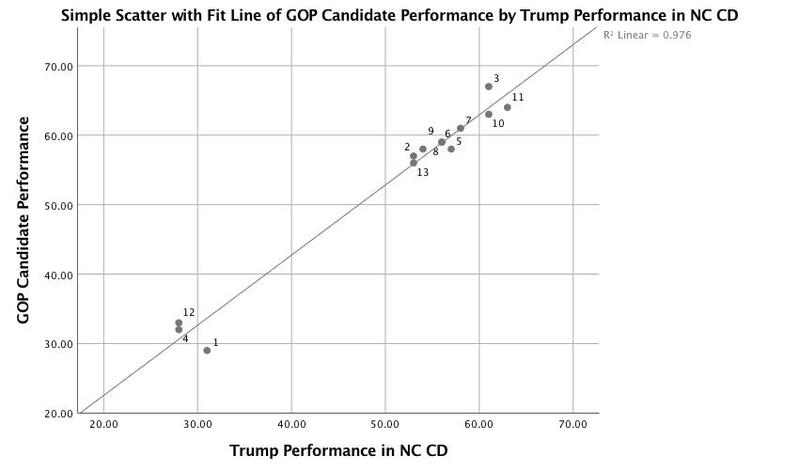 As I noted in a previous post, the relationship between Trump's performance and a GOP candidate's performance is pretty strong in North Carolina--partly meaning that Old North State voters aren't the "split ticket voters" that they once were. The 13th Congressional District Republican candidate, Ted Budd, garnered 56 percent of the vote, while Donald Trump received 53 percent of the vote in the same district. In the 9th Congressional District, Robert Pittenger received 58 percent of the vote, while Trump received 54 percent in the 9th district. Taken together, the relationship (through a simple linear regression analysis) between the Trump vote to the GOP candidate's vote gives an adjusted R-squared value of 0.976, meaning that the Trump vote explains 97.6 percent of the GOP congressional candidate's vote--a seemingly high and powerful relationship. 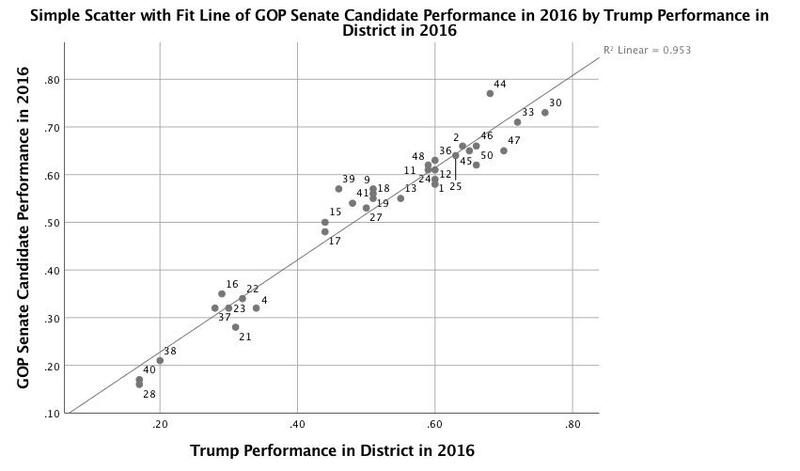 For state senate Republican candidates, the Trump vote in the district explains 95.1 percent (based on a simple linear regression analysis) of the vote for the GOP candidate. 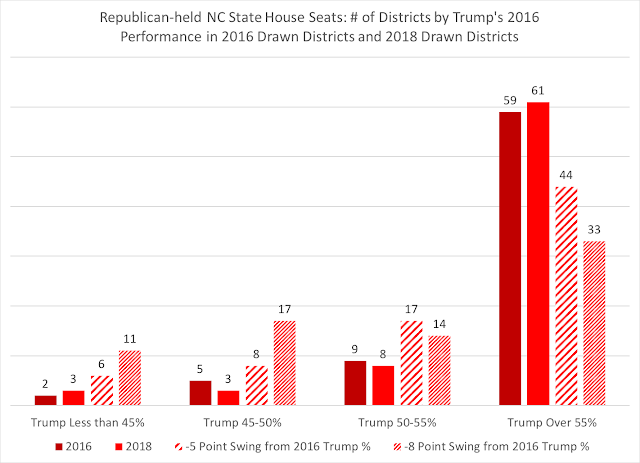 Taking this relationship between the Trump and Republican candidates' votes, one could use the Trump vote in the district as a potential "proxy" for how Republicans might perform in a district. Of course, North Carolina's legislative districts have changed, some quite considerably, due to various court challenges. But in taking the presidential vote within the new districts, we could analyze how many districts might be at risk if the president drags his party's candidates down. districts where Trump performed greater than 55 percent (likely safe districts for Republicans). a "wave/tsunami" like scenario of negative 8 percentage point move against Trump's 2016 vote performance in the district. Then, I classified the districts based on the above < 45%; 45-50%; 50-55%; and > 55% categories. In the 2016 performance, two senate districts had Republicans elected where Trump's performance was below 45 percent, and two districts where Trump received between 45 and 50 percent. 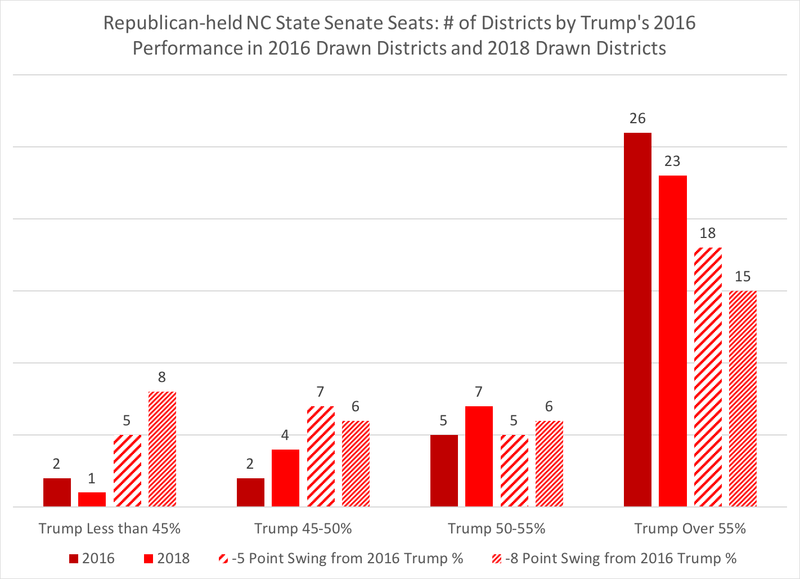 As you move towards the new districts (labeled "2018" that takes the 2016 presidential results and calculates within the new district lines), five senate districts have Trump's 2016 vote performance below 50 percent (one district below 45 percent and four districts between 45 and 50 percent). But as you look at the "wave" scenarios, a drop of 5 percentage points in Trump's 2016 district performances puts five senate seats below 45 percent Trump vote and another seven seats between 45-50 percent Trump vote. A larger wave of negative 8 percentage points puts eight senate seats below 45 percent, with another six below 50 percent. A reminder: majority status in the 50 seat chamber is 26 seats. Between the 2016 district lines and the 2018 district lines, Republicans could see one less district "vulnerable" in the less-than-50 percent scenario than they would have if the 2016 lines were in use this year. But the wave dynamics paint a quickly deteriorating scenario; six house seats become under 45 percent Trump in the 5 point swing, with another eight seats landing in the 45-50 percent category. With an 8 point swing against the president's vote performance, eleven seats fall under 45 percent Trump and seventeen seats fall into the 45-50 percent category. 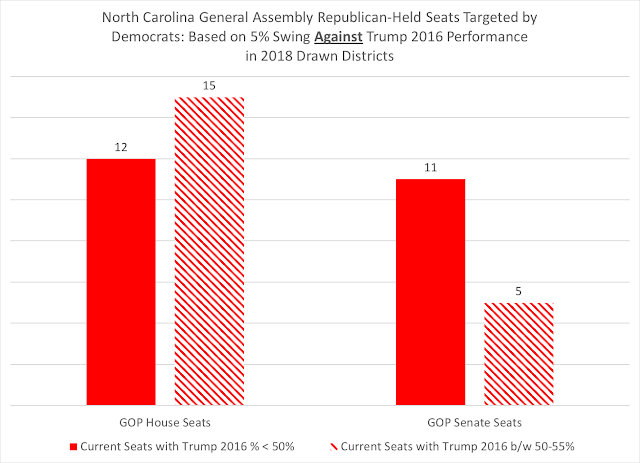 In the NC House, the majority needed for control is 61 seats. If 2018 is a repeat of 2016's performance, five Democratic-targeted house seats held by Republicans would have a Trump vote below 50 percent, with another seven current GOP house seats targeted by Democrats in the 50-55 percent range. In the state senate, four GOP-held districts are below 50 percent Trump vote, with another seven in the 50-55 percent range, that Democrats have targeted. In the state house, twelve GOP-held seats targeted by Democrats are under 50 percent Trump vote, with another fifteen in the competitive 50-55 percent Trump range. 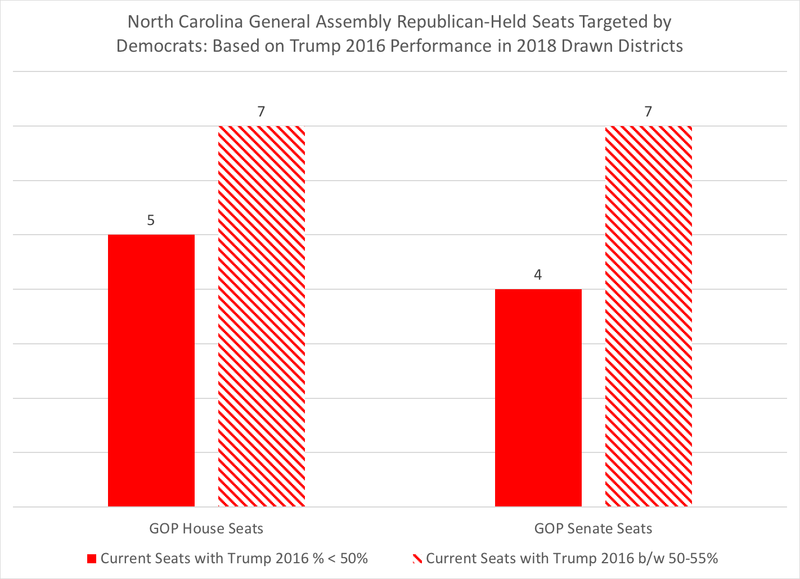 In the state senate, eleven GOP-held seats are below 50 percent Trump vote that Democrats have their sites set on, with another five in the competitive 50-55 percent Trump range. While presidential performance is not a "perfect" predictor of Republican vote performance down the ballot, mid-term elections tend to be referendums on the president's party. And some early polling in North Carolina shows that Republicans are being impacted on "generic" contests in this blue-moon election: in a recent High Point University poll, spreads of 3 to 5 percentage points for Democrats over Republicans were reported for state legislative and congressional contests, all within the poll's margin of error. And with the same poll showing President Trump's approval rating at only 40 percent, North Carolina may be mirroring the national environment that Republicans find themselves competing in for the coming months, though it seems like the state is not quite where national numbers are for the generic ballot. Another important factor is voter enthusiasm/motivation. In the February 2018 Elon University Poll, when asked "How motivated do you feel to get out and vote this year--extremely motivated, very motivated, somewhat motivated, not too motivated, or not at all motivated? ", 72 percent of self-identified Democrats said they were "extremely motivated" to 59 percent of self-identified Republicans and 55 percent of self-identified independents (page 16). One more important factor perhaps related to voter enthusiasm/motivation is voter turnout in the general election; as this post points out, North Carolina registered Republicans tend to have an advantage in recent mid-term elections when it comes to turnout rates. 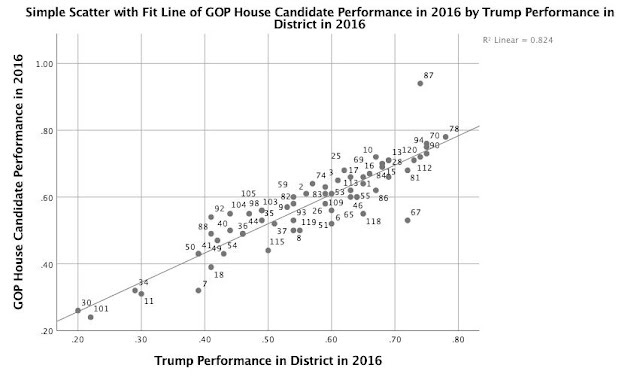 I would caution that this presidential-district performance analysis should not to be used for "predictive" value, but if the trend of a close relationship between the president's performance and the relationship to Republican candidates holds, the question becomes: how big is the "swing" that results in a blue wave for November, and which GOP districts have the potential for getting "washed out" this fall? * Update: due to typo in the House election results, the 11th House District was the Democratic candidate's election result rather than the Republican's result. The graph has been corrected, and the adjusted R-squared value increased from 0.75 to 0.82.